[map] [street view] Just west of AL-112 (Old Pensacola Road) near the Perdido River and AL/FL border, down Alec Road. AUX: 1 kW directional @ 981 feet. 60 dBu protected contour map, from the FCC. [Picture] Image of RDS text display from an Insignia HD portable, showing the PI (call sign) and Radio Text fields, from late 2016. 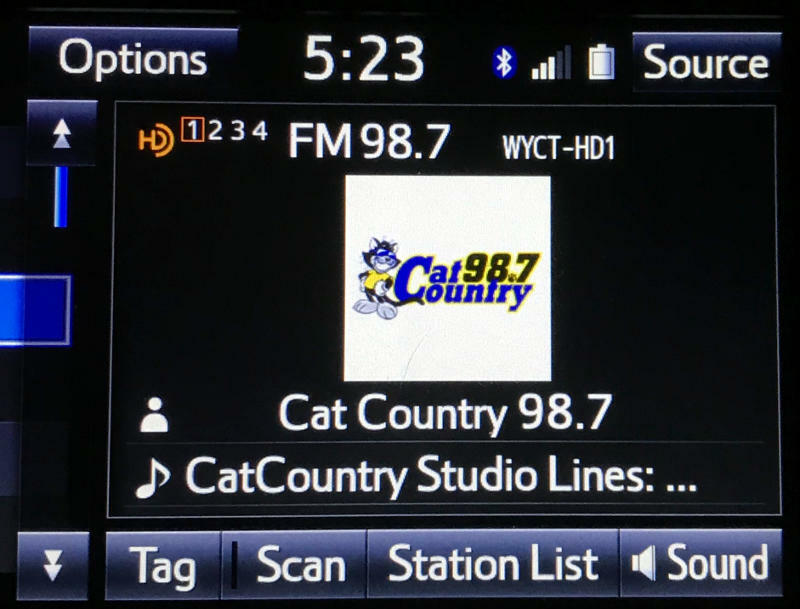 [Picture] Image of RDS text display from a Mazda sedan's radio, showing the PS (station name), Radio Text and PTY (format) fields, from mid-2017. [Picture] Image of the HD PAD data for the main channel, including station logo graphic, on a car radio, from December 2017. [Studio] Street View imagery of the ADX Pensacola studios behind University Town Plaza in Pensacola. [Aircheck] This "scoped" aircheck has had all the music excised (for copyright reasons), and includes all the commercial breaks over a 1.5 hour period on 23 August 2017. It features local ads, disc jockey patter, public service announcements, weather, traffic and more. Approximately 21 minutes in length. M4A (AAC) format, 27.97 MB total. This frequency was first allocated to the Pensacola area back around 1985 as a class C2, with a whopping 21 applicants vying for the last major dial position on the Alabama/Panhandle coast. Marty and Barbara MacGreevy of Perdido Key (Panama Mac's owner) got the intial decision from the FCC judge. Several behind-the-scenes delays occurred, delaying the debut of the station for over a decade: first, on of the losing applicants contested the FCC decision all the way to the Supreme Court. The moving of a transmitter licensed to Andalusia on 98.1 MHz later created more complex tower-siting issues. 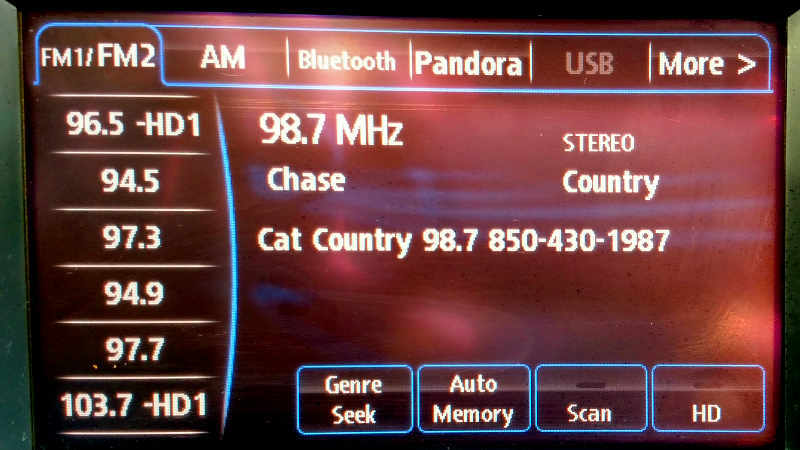 Eventually FCC policy changed, allowing the station to upgrade from a C2 to a C1 class, while iHeart Radio's Panama City station on 98.5 MHz accepted a voluntary downgrade from a class C1 to a C0. The station finally debuted in 2003, playing Christmas music to Pensacola. 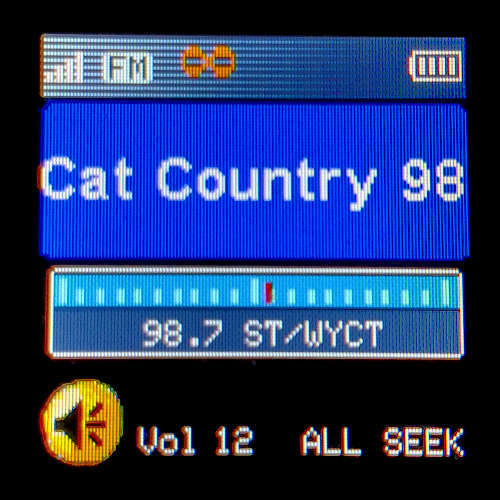 After the holidays it flipped to contemporary country as "Cat Country 98.7". This is the Mobile-Pensacola market's third country station. WKSJ plays primarily to Mobile and has miniscule ratings in Pensacola, and Pensacola's WXBM barely makes a dent in Mobile. In December 2003 it became the first station in the Mobile-Pensacola market to begin broadcasting using Ibiquity's HD Radio (IBOC) system. As of fall 2010 the HD had been switched off, although it came back on after a transmitter upgrade at the end of August, 2017, then went off a few days later. The station filed to operate the HD feature at higher than standard power (10% on the upper sideband, 5% on the lower sideband). The station began broadcasting in HD again in mid-December 2017, but with mono analog audio. The HD was off (again) due to technical issues in May 2018, but came on a few days after initially going off. Analog audio continued to be mono until mid-June 2018, when it finally went back in stereo. As part of the update to HD radio, the station began carrying sister News/Talk WNRP 1620 on the HD 3 and 4 channels, feeding a couple of area translators. In July 2018 a domain registration leaked the company's plans to launch a Sports Talk format on the HD-2, feeding W233CM on 94.5 MHz, a translator moved in to Pensacola from nearby Milton. It appears it launched on 22 August 2018, with one local show at noon and ESPN content the rest of the day. In March 2019, the HD-3 channel switched from WNRP to WEBY.